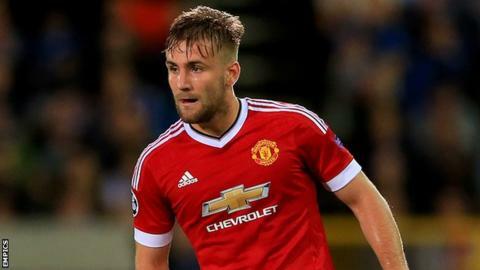 Manchester United manager Louis van Gaal says the "big loss" of Luke Shaw to serious injury leaves a gap in the defence which will be hard to fill. The 20-year-old left-back is recovering from surgery on a double fracture to the right leg he suffered in the 2-1 Champions League loss at PSV Eindhoven. Van Gaal said Shaw's season was "nearly finished" after Hector Moreno's tackle. He added: "We built up a left wing with Memphis and Luke Shaw. We have to start filling it again and it is not easy." Shaw, who started all eight games for United this season, is the only recognised left-back in their Premier League squad. However, Van Gaal, whose side are at Southampton on Sunday, is confident he has the right players who can deputise in his position. "It is not a problem, but Shaw is the line-up player and it is very difficult to replace him when he is in such a good shape," the Dutchman said. "In Daley Blind, Marcos Rojo and Ashley Young, we have good replacements." Blind moved to left-back against PSV following Shaw's injury, with Rojo, playing his first competitive match in over two months, coming on for Shaw to replace Blind at centre-back. Rojo could now start his first game of the season at Southampton, while captain Wayne Rooney is available again after overcoming a hamstring injury. Doctors are happy with the initial operation Shaw had on the night of the game, which set his leg together after a clean break of the tibia and fibula. He was due to undergo another procedure at the hospital in Eindhoven on Friday, but that will now be done in Manchester, with Shaw possibly allowed to fly home on Saturday. "It's a closing of the stitches or something," Van Gaal explained. "The pressure was too high, that's why an immediate operation was needed. "Because opening the leg you need to close it also. It's not an operation but it's a typical minor operation." Van Gaal spoke to his injured defender on Thursday. "He sounds very strong," he added. "Amazing for me. Big surprise. A good thing. But he knows it is a long way that he has to go. "His family is there and we have sent people to him. When he comes back we will have everything prepared. Maybe he will come back on Saturday. Then it's a long period of rehabilitation. "I am always saying that it is not physical but also mental. For us, it is a big loss. Also the team. I said it shall be the season of Luke Shaw. Now it is finished nearly."